Never Enough Nails: Happy Halloween!!! Graveyard Nails! Happy Halloween!!! My favorite day of the year has arrived! I decorated the inside and outside of my house, got lots of candy and did my Halloween nails. Now I'm sitting here and there have been only a couple of trick-or-treaters :(. I am about to watch Hocus Pocus, though, so that will cheer me up. 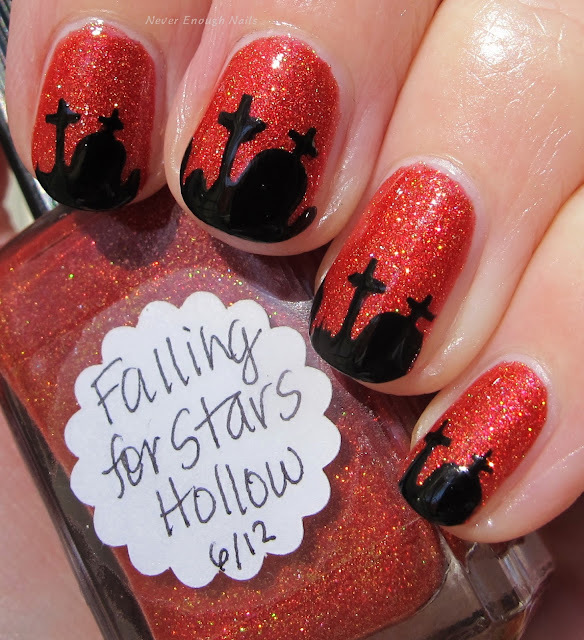 My Halloween mani is the new just released Lynnderella Falling for Stars Hollow with What's Up Nails graveyard vinyls. 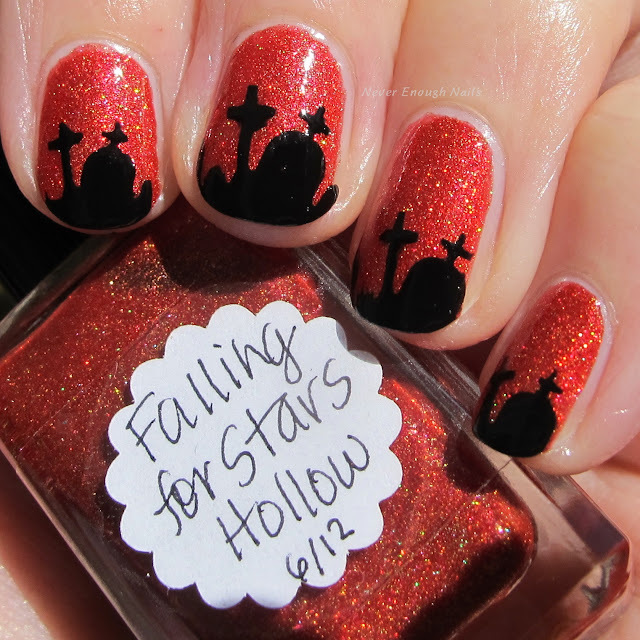 Falling for Stars Hollow is an excellent orange-y red with teeny golden holo glitter. It's like a glowing burning ember. Lynnderella describes it as "russet red shimmerella with gold holographic nanoglitter accents and red shimmer". As most of you know, red is not one of my personal favorite polish colors, but I am really feeling this one! 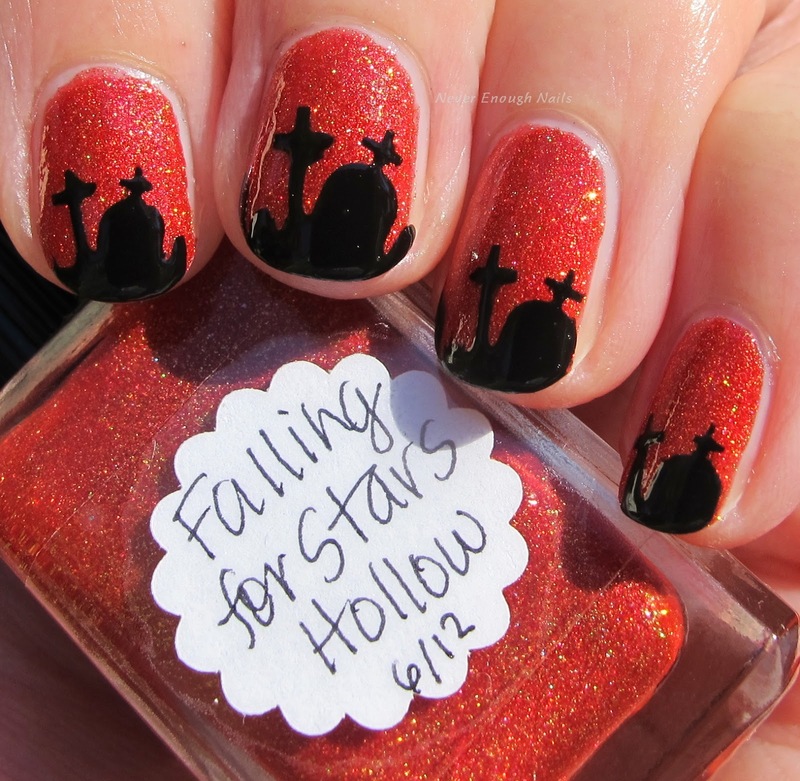 It goes perfectly with my Halloween vinyls and I think it will also be amazing with Thanksgiving and Christmas manis. 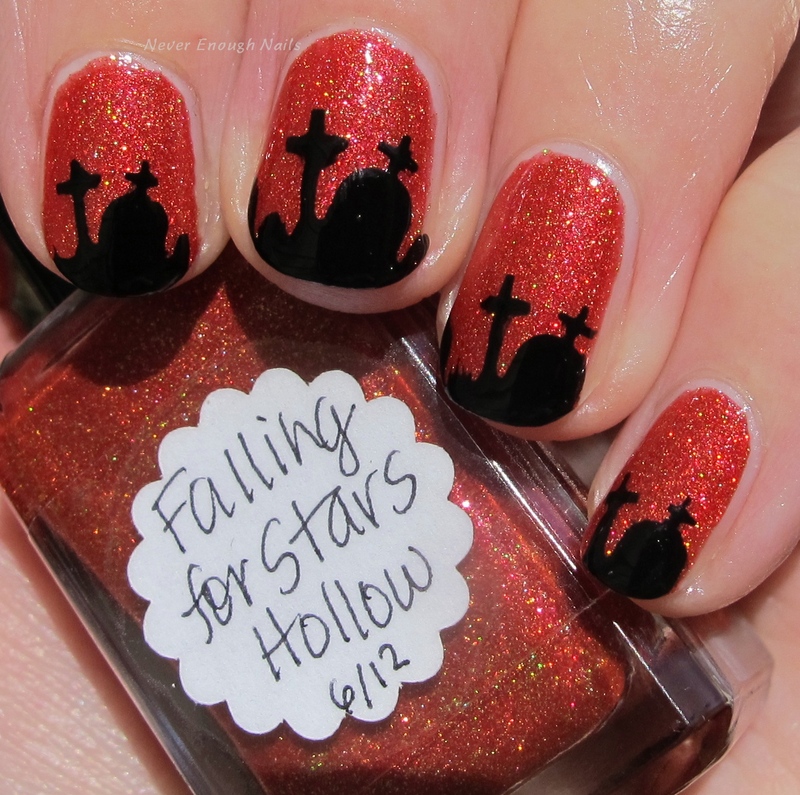 This was two easy coats of Falling for Stars Hollow. I used Sally Hansen Black to Black for the vinyl design. The What's Up Nails vinyls are my favorite ones to use. They are so easy to work with and always create a clean looking design. I have trouble removing some of the other vinyls I have tried, but these are easily gripped with my Tweezers and peel off perfectly every time. I plan to get a bunch of Christmas vinyls from What's Up Nails! 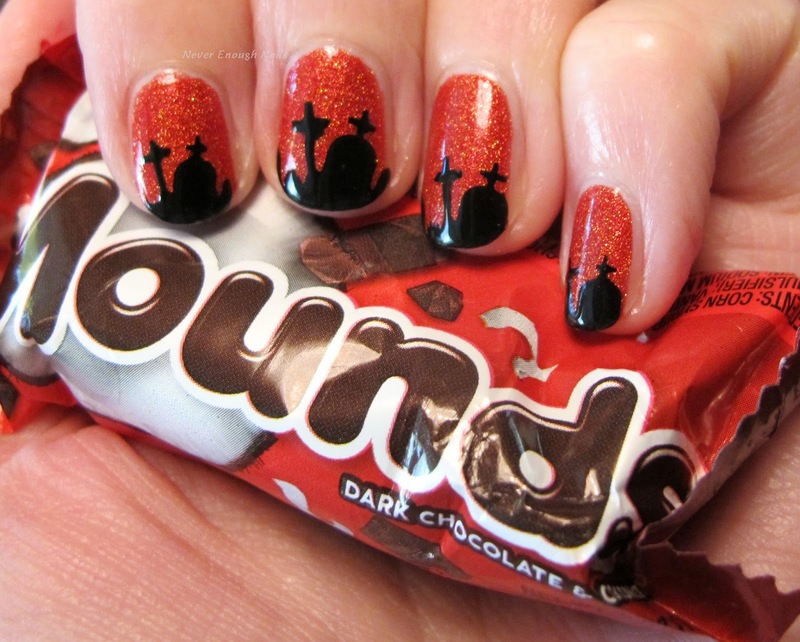 So I'll be hanging out eating my favorite Halloween candy (Mounds) and watching Hocus Pocus!! Lynnderella Falling for Stars Hollow will be available shortly on http://stores.ebay.com/lynnderella-lynnderella. 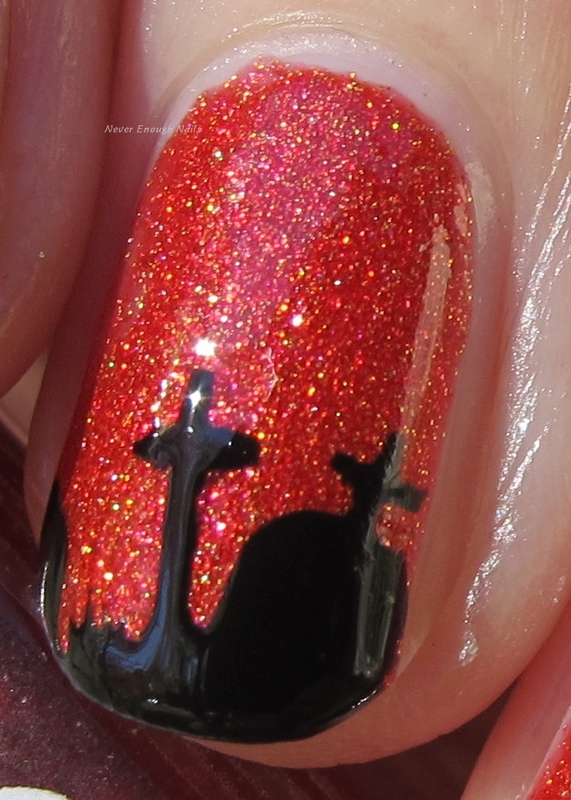 The graveyard nail vinyls are available on https://store.whatsupnails.com. Sally Hansen Black to Black, my new go to nail art black, is at a drugstore near you!